The Cambridge Community Foundation (CCF) has released a Request for Proposals to help Greater-Boston/Cambridge nonprofit organizations increase legal representation for low-income immigrants from Cambridge and surrounding under-served communities, currently facing or threatened with deportation proceedings. CCF will be distributing at least $150,000 already pledged by donors as part of a grass-roots campaign launched last spring to carry out the mission of the Cambridge Legal Defense Fund for Immigrants. “The immigration crisis is a humanitarian crisis that is playing out nationally and locally, affecting DACA recipients, asylum seekers, undocumented workers, and immigrant parents and their children who were separated at the border. No matter what side of the immigration debate you are on or what political party you support, as Americans–a country of immigrants–there is one thing that we should stand behind and that is the right to due process for all people,” said Geeta Pradhan, President of the Cambridge Community Foundation. “We are eternally grateful to the hundreds of residents who contributed to the Cambridge Legal Defense Fund for Immigrants. This was truly a grass-roots effort with people donating what they could. We are pleased to put this money to work right now as we continue to raise funds to address the urgent need for legal defense for immigrants in our communities,” Pradhan said. Proposals for grants must be submitted to CCF by Sept. 13th. The first cycle of grants is expected to be announced in early October. Data from Pew Research indicates that in 2014, there were 210,000 undocumented residents in Massachusetts, of which over 180,000 are in the Boston-Cambridge-Newton Metropolitan Statistical Area (MSA). While it’s difficult to ascertain city specific data, proxy data for Cambridge shows 27% of the population is foreign born and 40% of children have at least one foreign born parent. Cambridge is a sanctuary city and includes many undocumented students, workers and residents. The Cambridge Legal Defense Fund for Immigrants is the product of a joint effort between CCF and Mayor McGovern’s Office. Grants will be awarded to legal service providers following a competitive application process. Competitive proposals are expected from organizations offering urgent services, such as immediate deportation defense for low-income immigrants facing a serious risk of removal, including those detained and awaiting removal hearings, and protection against the threat of future deportation, including those eligible for relief or legal status to avoid deportation in the future, including asylum seekers, TPS workers, and DACA recipients. Immigrants with legal representation have a five times higher chance at a favorable outcome. The Cambridge Legal Defense Fund for Immigrants was seeded with a $50,000 grant from the Cambridge Community Foundation. The CCF received a $50,000 matching gift from the Louis Foundation, support from the Johnson Family Fund and the Why Wait Fund, as well as gifts from 250 residents ranging from $5 to $1,000 and above. 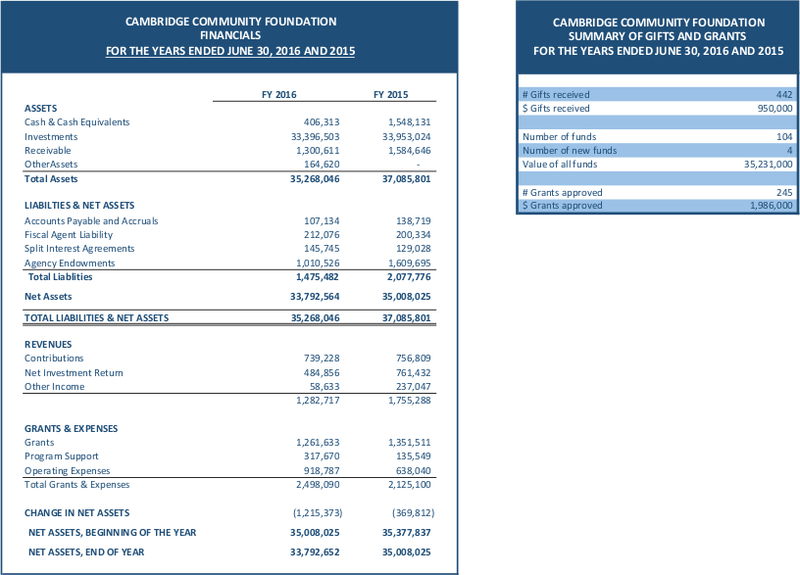 As the local giving platform for Cambridge, the Cambridge Community Foundation (CCF) supports the city’s shared prosperity, social equity and enduring cultural richness, with roots that go a century deep. We strive to deeply connect sectors across the community, to highlight emerging and critical needs, and catalyze efforts– through advancing philanthropy, grant making, and civic engagement– to ensure resources are focused where they can make the greatest difference.